Interests: Sarcasm. So don't cross me. 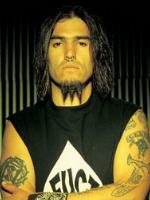 Foud a pic of him with a goatee and it scared me. So who is that in your pic anyway? Hmm, on re-read, I'd change "No time for sinners, 'cause" to something like "No time for sinning, 'cause,". Why? Because the whole point of Christianity is that we're all sinners and that we're supposed to be telling other sinners about God So we should have all the time in the world for "sinners." Cool, I'll have a look for it. Haven't spoken to thee in a while. How are you? Any new bands you know that i should be listening to? I'm kinda bored with everything at the moment, nothing seems to excite me. Girlfriend of Mic!! I love you baby! Kackarot is a good name for a cat! Winner of The Jedi Academy's Uber Oh My Gawd That Story Was Da Shizzle award. This comment was edited by Emm Son on Jun 06 2006 10:35pm. I don't really have a specific genre that I'm partial to. Because I like Bullet For My Valentine, yet I also like Green Day. I like Counting Crows, Franz Ferdinand, The Red Hot Chilli Peppers, The Rasmus, I even like Busted*!! So my taste is reasonably diverse! This comment was edited by Emm Son on May 03 2006 07:27pm. Are you saying Ni to that old woman?? that guy from Avenged SevenFold?